Between the internet's obsession and the 2015 horror flick that bears his name, chances are you've heard of Krampus, the legendary Christmas beast used to terrify generation after generation of children. But is Krampus real? The short answer is exactly what you'd expect: A resounding nope. The Krampus figure is as real as his companion, St. Nicholas — that is, not real at all outside of an overactive imagination. That being said, though, the legend itself has existed for hundreds of years, long before Krampus caught the internet's attention. If you need a refresher, here's what to know about Krampus. The "Christmas Devil," as he's often called, originated in the Alpine region of Europe, primarily Switzerland and Austria, several centuries ago. He serves as the counterpart to St. Nicholas; while good old St. Nick rewards good children, Krampus beats naughty children with a bundle of birch sticks and swings around a chain and bells. With horns, fangs, two hooves, and an ultra-long tongue, he bears a striking resemblance to the satyrs of Greek mythology. According to National Geographic, he's said to be the son of Hel goddess of the Norse underworld, so it should come as no surprise to hear that Krampus has a nasty habit of stuffing kids into his sack and dragging them down into the underworld with him. 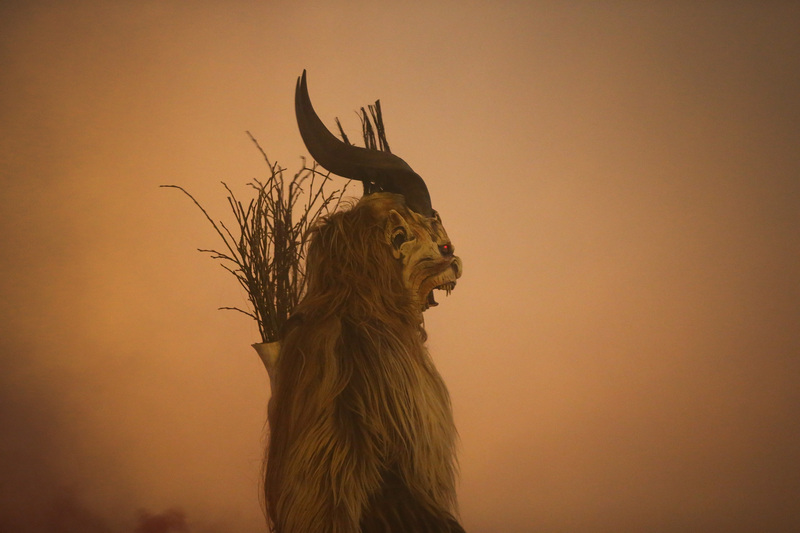 According to Smithsonian magazine, Krampus follows St. Nicholas around the night of Dec. 5, and his "arrival" is still celebrated in many Alpine towns today. But that's probably not where most people hear about the Christmas Devil. Instead, you've probably come across Krampus online, where the legend is popular enough that National Geographic charted its rise last year. As the article points out, Krampus has been the subject of a comic book and starred in his very own movie, and a growing number of Krampusnacht celebrations have been taking place in the United States recently. Why the increased interest? All we have are theories, of course — but here's a compelling one: "[Krampus] taps into a subconscious macabre desire that a lot of people have that is the opposite of the saccharine Christmas a lot of us grew up with," Jeremy Seghers, organizer of a Krampusnacht festival in Florida in 2015, told Smithsonian. It's understandable to wonder whether the Krampus legend is based on a real figure; after all, his companion actually existed. St. Nicholas was a famously generous bishop who lived in what's now known as Turkey during the third century. Over the centuries, the legend of St. Nicholas evolved into the beloved Santa Claus we know today. But although St. Nicholas existed, Krampus appears to be entirely fictional. Aside from a single "sighting" on a paranormal news website, there's no evidence that he's ever existed in the real world, even as a historical figure on which the legend was loosely based. Then again, try to avoid any naughtiness between now and Krampusnacht just in case. The holidays are tough enough without being beaten with a birch stick by a goat-demon.